Here is our first family portrait. The fact that it includes a giant T-Rex seems so fitting for us. I highly recommend the Dinosaur Park in Bastrop by the way. I love fun vintage elements like this doily by Minitoko and picture frame by Kitschy Digitals (background by Cosmo Cricket). I wish I was better at Photoshop I have so many trinkets and toys that I could easily photograph and turn into elements for my digi scrap adventures. Anyone tried their hand at this? I’m curious on the tips and tricks. I think this is my favorite picture of Baxter thus far. It would be awesome, though unlikely, if his eyes stayed that blue. This is also one of my favorite digital scrap book layouts I have done. (elements by Maybemej, Minitoko and Cosmo Cricket.) To further my obsession I also scored a new digital camera. I upgraded to a Nikon DSLR. Now I just need to figure out how to use it. Things like aperture are blowing my mind at the moment. 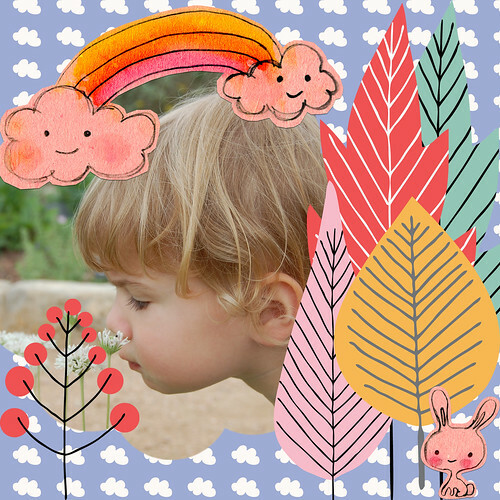 One of the things I am loving about Digital Scrapbooking is all the free goodies. Sure there are plenty of kits that you can pay for, but there are several cute free ones too. 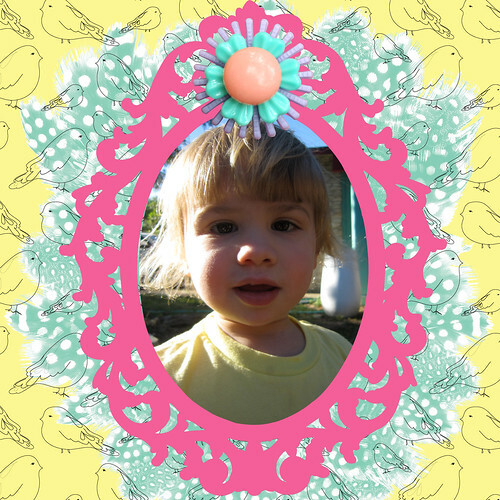 The feathers and flowers in this picture are free from Kitschy Digitals and the bird overlay is free from Maybemej. Posted May 31, 2011 & filed under digital scrapbooking, Kids. I really like digiscrapping too! You are right about all the freebies. For printing I use Persnickety Prints. These are really great, Jen! I'm trying though, not to make eye contact. I. Can't. Take on. More. Projects. I love the card you did for Clo's b-day so much! Vickie with all the traveling you have to do, you could do a bunch on the plane. Thanks Jenny I'm gonna check out Persnickety Prints. You are totes poneing on the digi scrapping thang…I think I might get my oldest to help me learn photo shop this summer. Thanx sooo much for your suggestions this past weekend…we had a fabulous time!!! We sorta couldn't believe how nice everyone was! I love that faux terrarium in the post below sooo clever. Your new baby is adorable Jennifer. Cute kids! Dallas-based Polka Dot Potato has great print services!